Following months of rumors, ToNeTo Atlanta can now confirm that Publix plans to bring their GreenWise Market to metro Atlanta next year. The new store, slated for East Cobb, will anchor a new joint venture development between Marietta-based Brooks Chadwick Capital and Atlanta-based Fuqua Development near the intersection of Shallowford and Sandy Plains Roads. The store will be about 25,000 square feet and could open as soon as next summer. The as yet unnamed project, rising on the site of the relocated Mountain View Elementary School (3448 Sandy Plains Road), would include not only the GreenWise but also about 45,000 square feet of "shop space" and a 110,000 square foot climate-controlled self storage facility, likely to be branded Extra Space Storage, according to sources close to the development. The shop space is to include at least two "chef-driven" restaurants and a handful of "upscale retailers," among other tenants. If all goes according to plan, the developers would close by the end of the year, with the development open by next summer. The new development is expected to about a $40-50 million project. The Cobb Board of Education sold the 13.8-acre campus on Sandy Plains Road early last year for $1 million an acre. A new Mountain View Elementary School (3151 Sandy Plains Road), about a mile and a half from the original campus, opened this past July. The old school, which has not yet been demolished, had been in use since 1970 and had outgrown its space. Local real estate sources confirmed to ToNeTo Atlanta earlier this year that the new GreenWise Market would be in addition to the existing Publix Super Market store in Highland Plaza across the street, and the Publix at Shallowford, less than four miles away. There are also a Kroger and a Target near the upcoming GreenWise store. Last year, when the company announced plans to restart growth of the GreenWise Market brand, the company made the following comments with regard to the concept. "We are committed to being the retailer of choice for consumers who are looking for specialty, natural and organic products," said Kevin Murphy, Publix Senior Vice President of Retail Operations. "Over the past several years, we have gained valuable insights from our existing GreenWise locations. By combining these learnings with customer feedback and market trends, we are better positioned to deliver on our vision of being the best at serving the evolving lifestyles of today's consumer." Local real estate sources tell ToNeTo Atlanta that the grocer is confident that there is enough room in the market for both its traditional store(s) to do well and for its GreenWise store to perform well too, as it caters to similar, but different consumers. Brenda Reid, Media & Community Relations Manager for Publix, said last month that she had no knowledge of a planned GreenWise store anywhere in Georgia. Local real estate sources, though, confirm to ToNeTo Atlanta that a lease [for the site on Sandy Plains] has been finalized and is "teed up" ahead of final approvals. GreenWise, like Whole Foods Market 365, is a concept in which the store's primary focus is on its own private label, healthy label, in Publix's case "GreenWise." The GreenWise label has been around since 2003, but the brand was launched as a standalone store in 2007. Atlanta is currently slated to be home to a pair of Whole Foods Market 365 stores, one in North Decatur Square near Decatur and the other in Paces Ferry Plaza in Buckhead. There are currently three GreenWise stores in existence - Boca Raton, Palm Beach Gardens and Tampa, Florida - although the company announced plans last year to open three more stores in the coming months, the first of which is expected to open in late September in Tallahassee. A second new GreenWise is planned for Mount Pleasant, SC, with an expected opening in early 2019, followed by a third new store in Lakeland, Florida, the corporate home of Publix. The Lakeland store, which Publix officials confirmed this past March, thus far has no opening timetable. In addition to the Atlanta store, ToNeTo Atlanta has confirmed that the company has plans for at least one other new GreenWise Market. The new store, slated for Lakeside Centre in Boca Raton, will replace Off Broadway Shoes, which is currently liquidating ahead of their planned June 16 closure. The new GreenWise is expected to only take about 25,000 square feet of the roughly 32,500 square foot shoe store to more closely match the grocer's current model. The existing Boca Raton GreenWise, located in Boca Village Square, about three miles away, adjacent to Boca Town Center Mall, is expected to remain open for now, according to a source at the store. The current Boca Raton store is 36,000 square feet. 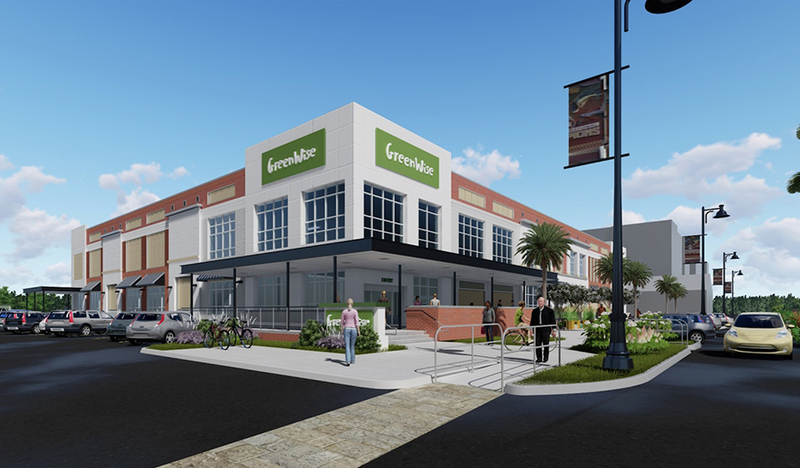 The new GreenWise Market in Boca could open in early 2019, according to real estate sources. Rumors that the previously announced Publix planned for Fuqua Development's Madison Yards development on Memorial Drive in Reynoldstown would eventually open as a GreenWise are thus far unsubstantiated. GreenWise currently only has a teaser website up but Publix promises more updates on the new stores soon. Are you excited for the addition of GreenWise Market to East Cobb? Do you think there is room for both GreenWise Market and traditional Publix Super Markets to do well in East Cobb? What is your favorite grocery store? Why? My thoughts are that this GreenWise is all very nice and everything, however, there is a Whole Foods not far away. I believe an ALDI or Trader Joe's would be a much better fit for the area. There prices are competitive and offer a little different assortment and give the customers more options, except more of the same thing?! The parking would be great for this store as the one off Roswell road leads people away with the configuration of the parking set-up. Let's hope all thoughts go into putting in not just one option of another grocery store, but also what is good for the whole area. Appreciate you taking this into consideration. Aldi offers options these other stores do not. An East Cobber for over 42 years here. Please consider putting in an Aldi or a Trader Joe's grocery store. It would really be helpful with all the other stores and give us more options, but the same thing. As an East Cobber for over 40 years, and where the other Trader Joe's is on Roswell Road, it's makes it hard for customers to park and it isn't friendly for parking. This new space would be ideal for that type of store. Please consider this before making the final decision, I believe others would agree. Most of the people who I talk with love the Trader Joe's concept and would like another one in this area. I love the concept. Should be very successful. I don't like the storage facility idea. I would rather have seen an Aldis or Trader Joe's go in that spot. I really don't see the need for the Publix GreenWise store. Chances are I won't be shopping at this new store because it's not of any interest to me. @ Anon @ 6/11 @ 7:59AM - Sadly, you are right. Trader Joe's is not resonating in the Atlanta area like it does elsewhere. They have shown no interest in expanding in Atlanta and I'm actually surprised they haven't closed any. I like TJ's so I want them to be successful, but let's be happy with what we have here - even if it's not located as close to your homes as you'd like them to be. Aldi!! Or trader joes.publix is so very overpriced and their name rand is not good. Also, please for the love of Pete can we get Kroger to come back to east piedmont and sandy plains. This really is the next stage of the Atlanta grocery wars. I grew up in Florida going to Publix with my family, but when I moved to Atlanta there was only one Publix store in Georgia, located in the heart of Buckhead. Since then Publix has pushed many other grocers aside or out of the market. This is there attempt to fight back against Whole Foods and Sprouts, focusing on healthy fare and other updated concepts. Greenwise is still a test concept, by the sound of it, so I'm sure they are testing the market to see how adding the new concept will impact surrounding Publix and rival stores. It's a great location, with lots of traffic. I don't eat any meat or animal products, so I'm excited to see what they have to offer for me. Kroger is never coming back to that area---the store they had at that location was so trashy and dirty.